The following is a list of campus organizations and clubs and brief descriptions of their functions. Bringing the art students together to host various activities on campus and in the community. Coordinating events at the ACA to promote growth and to connect fellow students. Traveling to local elementary, middle, and high schools to educate students about art majors. Sponsor: Kimberly Parker contact Kimberly.parker@calhoun.edu. Baptist Campus Ministries, Christian Fellowship, is a Christ-centered organization that offers students the opportunity to grow in leadership skills, discipleship, and personal relationships. Students will find worship, Bible study, music, food, fun, friends, mission trips and much more. Our goal is to help each others grow in their relationship with Christ, and help lead others to Him. Our weekly Bible studies consist of praise and worship, Bible study, and Biblical discussions. We are formally supported by Baptist Campus Ministries, but we are not just for the Baptist denomination. Throughout the school year, we have many activities. We go on mission trips, retreats and conferences. Sponsor – Willie Alexander, walexander@alsbom.org. BCM Bible Studies are held on the Decatur Campus on Thursdays from 12:30 p.m. – 2:00 p.m. in the Brewer Library Instruction Room . BCM will hold a “See You At The Pole” event on the first and third Thursday at 12:00 noon to hold prayer for the school. The Bass Fishing Team is a group of seasoned student anglers that compete in college bass fishing tournaments on a national level with 2 and 4 year colleges and universities. They compete in the FLW, BASS, and Boat US Tournament series. If you have bass tournament fishing experience, we want to speak with you about becoming part of a nationally ranked team. Please contact Meg Graham, Bass Fishing Team Sponsor for more information at 256-306-2835. The purpose of the Calhoun Community College Biological Sciences Research Group (CCCBSRG) is to involve students in original scientific research in a laboratory and field setting. Students will participate in all stages of research including planning and design of projects, performance of experiments, recording and interpretation of data, drafting of scientific articles, and submission of articles for publication in appropriate academic journals. Students will develop laboratory skills, awareness of laboratory safety, and ethical practices when performing research. This group is open to all students, regardless of major. Those who major in Biology are encouraged to join. Contact Dr. Don Collier or Mr. Cody Gibson for additional information or to join. Also, visit the official Facebook page at https://www.facebook.com/CalhounResearch. BSA website – A one-of-a-kind group open to all students who want to get to know other students, talk about/plan activities, resolve questions or issues pertaining to Black students, respond to campus and community concerns, and enjoy college life together. The purpose of the Black Students’ Alliance is to serve as a means of promoting unity, success and the involvement of Black students in campus life at Calhoun Community College. Club designed to encourage interest in reading at Calhoun. The club will also discuss and share opinions on plot-lines, characterization, and the writing style of books. Faculty sponsor – Dr. Parvathy Bhooshanan (256) 890-4730. The Broadcasting / Photography Club is dedicated to providing opportunities for students to experiment with and gain hands-on experience in the continuously evolving communications mediums of television, radio, digital photography and multimedia production. The club also serves as a forum to inform, educate and entertain. Students engage in fun-filled activities via special exhibits, seminars, production shoots and studio recordings. Sponsor – Wes Torain, 256-306-2965 wes.torain@calhoun.edu. This club is designed to promote a spirit of citizenship, leadership, and fellowship among the members of the CDC (Child Development Club), to encourage responsibility for maintaining the high ideals of the child development profession, and to encourage future participation in child development organizations upon graduation. Sponsor – Susan Satterfield 256-890-4788 Susan.Satterfield@calhoun.edu. This is a support group for students with, or students interested in, Autism Spectrum Disorders. Interested parties can contact Dr. Ina Smith – ina.smith@calhoun.edu. A club organized to broaden student’s horizons who are seeking a career in Criminal Justice and related fields. Sponsor – James Stewart – 256-890-4785. The Debate Club gives students who are interested in public speaking the opportunity to work and develop their speaking skills as well as learning the ability to form debates. Creating an environment where all students are welcome to come and learn. Sponsor – Holly Powell, holly.powell@calhoun.edu or 256-890-4868. Auxiliary to theatre program whose purpose is to foster student interest in theatre arts by participation in theatre performances. Sponsor – William Godsey, 306-2701, e-mail: will.godsey@calhoun.edu, Fine Arts, Meets: TBA. Gathering of Gamers is a student-led club focused on only tabletop games at this time. It is open to all students. Gatherings are for casual play and possible events/competitions. This club provides network and collaboration opportunities. BYOS – Bring your own stuff! Faculty Advisors – John Gaines 256-306-2748 (john.gaines@calhoun.edu) and Tori Norris 256-306-2731 (tori.norris@calhoun.edu). The purpose of the Calhoun Community College Interfaith Club is to promote interaction and understanding of world religions and spiritual philosophies, thus fostering dialogue between people of different faith backgrounds, and the support and acceptance of religious diversity. Sponsors: Susan LoCascio (256) 306-2757 and Dr. Parvathy Bhooshanan (256) 890-4730. To provide educational opportunities outside of the classroom for those interested in the Spanish language and culture, to help students and the community understand and learn more about the Spanish cultures of Latin America, Spain, and the local Latino community. This club is also organized to expand knowledge and appreciation of the language, customs, history, cultures, and social life of Spanish speakers through events, and to provide a safe and sober environment for students to engage in oral usage of the Spanish language. Sponsor- Dr. Waymon Burke (256)890-4737. The goal of the team is to design, build and race a simulate lunar roving vehicle in the annual NASA Human Rover Challenge Race at NASA’s Marshall Space Flight Center in Huntsville, Alabama. The race was inspired by the development of the first lunar roving vehicle, which was designed and tested at Marshall Space Flight Center. The event challenges students to design and build a human-powered vehicle to address engineering problems similar to those actually faced by the original NASA lunar rover team. Main goals of the project are to attract students to aerospace related application and implement existing NASA educational programs in a real-world design challenge. Sponsor – Keith Davis, 256-306-2912. Promotes citizenship, leadership and fellowship; encourages responsibility for maintenance of high ideals for the nursing profession; encourages future participation in professional nursing organizations. Sponsors: David Welsh, 306-2988, e-mail: david.welsh@calhoun.edu, Deby Lee, 306-2803, e-mail: deby.lee@calhoun.edu. Meeting dates and times: TBA. Phi Theta Kappa website – Phi Theta Kappa is the International Honor Society of the Two-Year College. Students who are enrolled (part-time or full-time) at Calhoun, have at least a 3.5 cumulative GPA, and have already earned at least 12 semester hours creditable toward a two-year degree are invited at the beginning of each semester. Phi Theta Kappa focuses on activities and events relating to our four hallmarks: leadership, scholarship, service and fellowship. 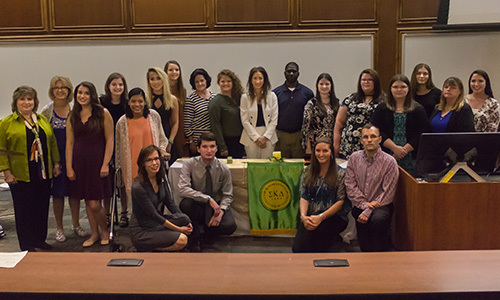 Each member is encouraged to be active in our organization in order to gain servant leadership experience, widen the scope of his or her knowledge, increase competitive scholarship opportunities and fellowship with other Phi Theta Kappa members in the chapter, state, nation and across the globe. Advisors – Dana Burton, 256-713-4873 (Huntsville Campus). To promote citizenship, leadership, and fellowship among the members of the organization, to encourage responsibility for maintaining the high ideals of the PTA profession, to encourage future participation in the professional PTA organization upon graduation, and to provide PTA student representation and communicate concerns to and from the college administration and faculty. Sponsor- Tiffany Bain, (256) 260-2439. See the Sigma Kappa Delta website – Sigma Kappa Delta is the National English Honor Society for students in two-year colleges and was created by Sigma Tau Delta, the International English Honor Society for university students. Visit the website of Calhoun’s Chapter of SKD, Theta Beta. Those who qualify are inducted by invitation. The advantages of SKD include life-long recognition for academic excellence; a chance to qualify for scholarships and to publish; the opportunity to participate in activities that celebrate theatre, art music, reading, and writing; and a chance to attend conferences both locally and nationally. Sponsors – Decatur Campus: Leigh Ann Rhea (256) 306-2940 and Julie Sneed (256) 306-2723; Huntsville Campus: Jordan Taylor 256-713-4867, jordan.taylor@calhoun.edu and Christie Lamon Burney 256-713-4826, christie.burney@calhoun.edu. Call for meeting times and locations. SkillsUSA is a national organization serving high school and college students who are enrolled in training programs in technical, skills and service occupations, including health occupations programs and tech prep. SkillsUSA has more than 300,000 members in 13,000 chapters and 53 state and territorial associations. SkillsUSA was established in 1965 and has served more than 9.5 million students. Sponsors: Nick Agrawal (890-4751), Mark Rose (306-2814), Nina Bullock (306-2813) Tad Montgomery (306-2669) and Patrick Rouse (256) 306-2848. Dedicated to promoting life and family. We devote ourselves to issues including human trafficking, abortion, euthanasia, marriage, immigration, and poverty through discussion, presentations, and service. Come join us and help build a culture of life. Learn more and get involved by contacting the club sponsor, Jim Payne, at james.payne@calhoun.edu or 256-306-2684 or Deborah Enfinger deborah.enfinger@calhoun.edu 256-306-2679. Calhoun’s LGBT+ Group – An all-inclusive organization created to be a support system for the members of the LGBT+ (Lesbian, Gay, Bi, Transgender, etc.) community, making Calhoun a more open, accepting place that facilitates an understanding and thoughtful outlook on sexual orientation and gender identity. This is a safe place for like-minded individuals to have social support, and a time for non-judgmental engagement with others. Spectrum meets every Thursday of the month at 12:30 p.m. to 2 p.m., and third Monday of each month at 2 p.m. to 3:30 p.m. in Room 305 on the Huntsville Campus. Warhawks website– The Warhawks are Calhoun’s official hosts and hostesses. They represent the college at official functions, give campus tours, host student and faculty receptions, represent Calhoun Community College at various high school programs, and lots of other exciting activities. It’s a great way to meet other students, faculty and administrators, and become involved in student activities. Some of the requirements for being a Warhawk are a positive attitude, a minimum GPA of 3.0, and 12 hours. Sponsors: Janet Kincherlow-Martin, 256-306-2561, Sherika Attipoe, 256-306-2560 and Dr. Sherry Stancil (Huntsville), 256-713-4824, Chason Shackelford, 256-260-4301. The Warhawks meet every Wednesday at 1:00 p.m., Decatur Campus Math/Science Building Conference Room; Huntsville Campus Administrative Conference Room.